Apple cider vinegar is considered as a great secret for gorgeous skin because it contains potassium, which helps regenerate healthy tissue. It regulates the pH of the skin, and removes dead cells and excess oil. Moreover, it has anti-bacterial, anti-viral, and anti-fungal properties. No wonder most beauty care recipes involve the use of apple cider vinegar as one of the chief ingredients. However, it should not be used straight (undiluted) on skin as it is quite strong. Hence, you can combine it with honey to make your skin beautiful and healthy. Furthermore, you can add a cup of ACV in your bath water in case you are suffering from mild itching and skin irritation. Besides, you can take apple cider vinegar supplement when having sudden breakouts on skin. These tablets boost metabolism, improve circulation, and eliminate toxins as well. You may drink a glass of water mixed with two tablespoons of apple cider vinegar regularly as an effective health tonic. • Take a cup of orange blossom water, half a cup of apple cider vinegar, a quarter of honey and mix these ingredients. You may add a few drops of lavender essential oil, too. Soak a cotton ball in this mixture and use it on your skin. Leave the solution on your face overnight to get rid of nasty pimples and acne. In case you do not have orange blossom water, use rose water, a solution of green tea or chamomile tea. • Another popular remedy to promote clear skin and reduce acne is to steep green tea in hot water for about 15 minutes. Allow it to cool. Next, add one-third cup each of apple cider vinegar and distilled water in it. Apply it on your skin before bed time and rinse it off in the morning. Check out this video shoing apple cider vinegar exfoliant/mask and toner recipes. • Applying a combination of two teaspoons of apple cider vinegar and one teaspoon of onion juice helps heal age spots. • To cure blemishes, dilute one tablespoon of ACV in about five tablespoons of water and dab it the affected areas. You can follow this therapy in the night before going to bed so that the solution remains on your skin for a long time. • When dealing with blotchy skin, apply ACV diluted in water, leave it for about five minutes and then put aloe vera gel on skin. 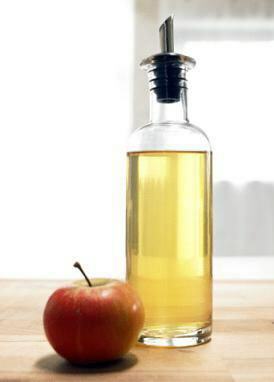 • You can prepare a simple skin toner by adding four parts of water in one part of apple cider vinegar. Soak a cotton ball in this solution and apply it on your skin two times in a day after cleansing it. • Those who have oily skin can use a mixture of two cups of witch hazel extract, one-third cup of ACV, and seven drops of lavender essential oil. For dry skin, blend a papaya along with apple cider vinegar and apply the resultant face pack as a toner. Alternatively, you can use a combination of one tablespoon of wheat germ oil and a teaspoon of apple cider vinegar. • Prepare a homemade face mask for acne by combining one part of green clay with two parts of apple cider vinegar and add sufficient water to form a paste. Apply this mixture on your face and wash it off with cold water after 15-20 minutes. • Soaking your feet in a mixture of equal parts of apple cider vinegar and water for about 15 minutes is useful in the natural treatment of athlete’s foot at home. You can follow this procedure several times in a day. Apple cider vinegar is also beneficial for hair as it works as a great conditioner and cleaning agent. Thus, you can rinse your hair with a solution of one cup of distilled water mixed with a tablespoon of apple cider vinegar. Use this recipe as a final rinse about once in a week after shampooing to remove scalp residue, restore a healthy sheen, and balance the pH levels of your hair.